“These new Arranger Workstations bring even more features and top-notch content to an already robust legacy of composition, recording and performance keyboards,” said Dane Madsen, marketing manager, Digital Pianos, Yamaha Corporation of America." 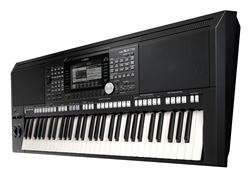 Yamaha today launched the PSR-S975 and PSR-S775, two 61-key Arranger Workstation keyboards that offer compelling new features for all-in-one performance, songwriting, arranging and recording. The elegant, intuitive and powerful PSR-S975 is the new flagship of the PSR-S line. It gives users a comprehensive set of musical tools designed to let them realize their musical ideas quickly, with lots of control. Both new keyboards sport a built-in MP3 lyrics player. Users now have the ability to display lyrics from MP3 songs on the keyboard's 7-inch color LCDs. The PSR-S975 can connect to an external display for ultimate audience participation. The PSR-S975 and PSR-S775 provide a range of powerful audio-centric features. Vocal Cancel lets users effectively remove the vocal or lead instrument from an audio song to create "minus-one" tracks for practice or karaoke-style performance, and even change their pitch and tempo independently. The PSR-S975's Audio Styles include audio rhythm tracks played by real musicians that aren't emulating the real thing, they ARE the real thing. Both new keyboards are compatible with the optional Yamaha KS-SW100 subwoofer, giving their powerful onboard speaker systems the capability to sound even bigger. "These new Arranger Workstations bring even more features and top-notch content to an already robust legacy of composition, recording and performance keyboards. Updates that our customers have been asking for, such as the MP3 lyric display and additional onboard Flash ROM now come standard," said Dane Madsen, marketing manager, Digital Pianos, Yamaha Corporation of America. "And as always, the PSR-S series continues to be one of the most powerful songwriting tools around. Songwriters can get from an idea to a fully arranged demo faster than ever." The PSR-S975 is loaded with a whopping 768MB of Flash ROM-up from 512MB on the previous flagship-preloaded with Yamaha Voice and Style Expansion content. It offers close to 1,000 instrument Voices, including grand piano, strings, brass, drums, EDM synthesizers, and much more. It features a guitar/mic input, USB audio recording and sample playback via the flexible multi-pads. The PSR-S775, which includes many of the same features at a lower price point, includes 280MB of Flash ROM and 930 instrument Voices, an increase of 100MB and 100 Voices from the model it replaces. Yamaha PSR-S975 (MSRP: $2,599) and PSR-S775 (MSRP: $1,699) keyboards will ship in February 2018.